This is extremely interesting and the size suggests that this particle occurs naturally as well. Add in the known affinity to carbon and we see a way to self assemble gold in sediments. I am also pleased to see this level of detail can now be investigated and modeled so well. It is way more unusual than i ever imagined or anyone else. An organic process was postulated many years ago, but no one had any idea how it might occur. This at least opens the door. All good stuff. Nano chemistry is as large as i anticipated. The X-ray crystallographic structure of the gold nanoparticle is shown. Gold atoms = magenta; sulfur atoms = yellow; carbon atoms = gray; hydrogen atoms = white. Image courtesy Carnegie Mellon. For a larger version of this image please gohere. Our world is full of patterns, from the twist of a DNA molecule to the spiral of the Milky Way. New research from Carnegie Mellon chemists has revealed that tiny, synthetic gold nanoparticles exhibit some of nature's most intricate patterns. Unveiling the kaleidoscope of these patterns was a Herculean task, and it marks the first time that a nanoparticle of this size has been crystallized and its structure mapped out atom by atom. The researchers report their work in the March 20 issue of Science Advances. "As you broadly think about different research areas or even our everyday lives, these kinds of patterns, these hierarchical patterns, are universal," said Rongchao Jin, associate professor of chemistry. "Our universe is really beautiful and when you see this kind of information in something as small as a 133-atom nanoparticle and as big as the Milky Way, it's really amazing." Gold nanoparticles, which can vary in size from 1 to 100 nanometers, are a promising technology that has applications in a wide range of fields including catalysis, electronics, materials science and health care. But, in order to use gold nanoparticles in practical applications, scientists must first understand the tiny particles' structure. "Structure essentially determines the particle's properties, so without knowing the structure, you wouldn't be able to understand the properties and you wouldn't be able to functionalize them for specific applications," said Jin, an expert in creating atomically precise gold nanoparticles. With this latest research, Jin and his colleagues, including graduate student Chenjie Zeng, have solved the structure of a nanoparticle, Au133, made up of 133 gold atoms and 52 surface-protecting molecules--the biggest nanoparticle structure ever resolved with X-ray crystallography. While microscopy can reveal the size, shape and the atomic lattice of nanoparticles, it can't discern the surface structure. X-ray crystallography can, by mapping out the position of every atom on the nanoparticles' surface and showing how they bond with the gold core. Knowing the surface structure is key to using the nanoparticles for practical applications, such as catalysis, and for uncovering fundamental science, such as the basis of the particle's stability. 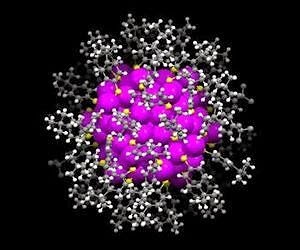 The crystal structure of the Au133 nanoparticle divulged many secrets. "With X-ray crystallography, we were able to see very beautiful patterns, which was a very exciting discovery. These patterns only show up when the nanoparticle size becomes big enough," Jin said. During production, the Au133 particles self-assemble into three layers within each particle: the gold core, the surface molecules that protect it and the interface between the two. In the crystal structure, Zeng discovered that the gold core is in the shape of an icosahedron. At the interface between the core and the surface-protecting molecules is a layer of sulfur atoms that bind with the gold atoms. The sulfur-gold-sulfur combinations stack into ladder-like helical structures. Finally, attached to the sulfur molecules is an outer layer of surface-protecting molecules whose carbon tails self-assemble into fourfold swirls. "The helical features remind us of a DNA double helix and the rotating arrangement of the carbon tails is reminiscent of the way our galaxy is arranged. It's really amazing," Jin said. These particular patterns are responsible for the high stability of Au133 compared to other sizes of gold nanoparticles. The researchers also tested the optical and electronic properties of Au133 and found that these gold nanoparticles are not metallic. Normally, gold is one of the best conductors of electrical current, but the size of Au133 is so small that the particle hasn't yet become metallic. Jin's group is currently testing the nanoparticles for use as catalysts, substances that can increase the rate of a chemical reaction. Jin's collaborators include Zeng and Yuxiang Chen, graduate students in CMU's Chemistry Department; Kristin Kirschbaum, research associate professor at the University of Toledo, who performed the X-ray crystallography; and postdoctoral fellow Kannatassen Appavoo and staff scientist Matthew Y. Sfeir, who carried out the femtosecond optical studies, at the Center for Functional Nanomaterials at Brookhaven National Laboratory. The research was supported by the Air Force Office of Scientific Research and the Camille Dreyfus Teacher-Scholar Awards Program.